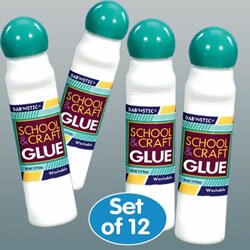 A large selection of glue and adhesives are helpful for any project. 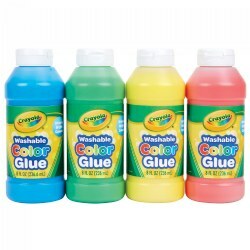 Kaplan offers washable glue, glitter glue, confetti glue, glue guns, and glue sticks. Adhesive rolls, masking tape, and glue spreaders are also available. A teacher's favorite! A non-toxic, non-flammable glue that bonds fast. Perfect to use with wood, paper and other porous materials. 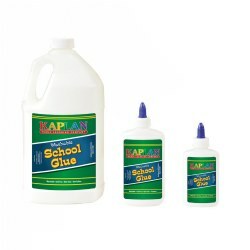 We offer this glue in multiple sizes including 4 ounce, 7 5/8 ounce and gallon size. 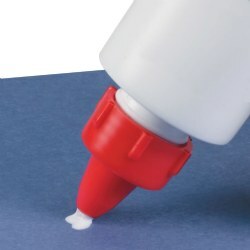 All purpose washable white glue lasts as long as 5 glue sticks or two 4 oz. bottles. Dries fast, won't clog and is non-wrinkling. 1.7 oz bottle. 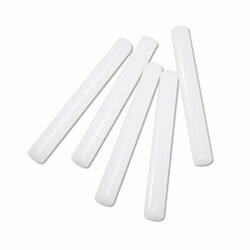 Washable, non-toxic white glue sticks in a variety of sizes and styles to meet all your classroom needs. Medium glue sticks are .28 oz. 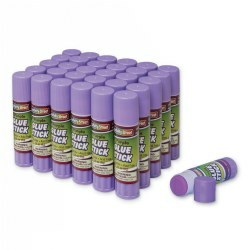 each, large glue sticks are .70 oz. each, and jumbo glue sticks are 1.41 oz. each. Set of 30 per size. Store in a cool, dry place. 3 years & up. The adhesive on these rolls of tape is repositionable. Easier for younger children when doing arts and crafts, and great for little hands to work with. 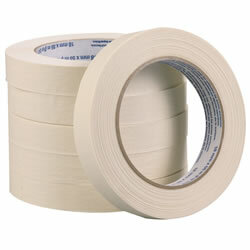 Kraft Tape rolls are 1" wide x 60 yards with 3" core. 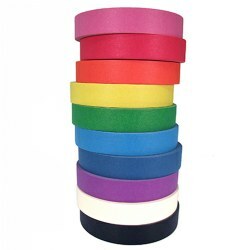 The set of 10 includes one each of: red, pink, orange, yellow, green, turquoise, blue, purple, white and black. 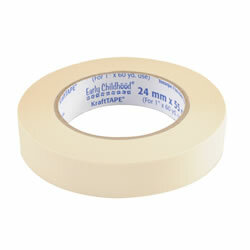 Also available is a 10-Roll Kraft Tape with Dispenser. 3 years & up. Perfect for children's crafting projects, these washable, non-toxic glue sticks go on purple, showing where the glue is placed, then disappears as it dries. 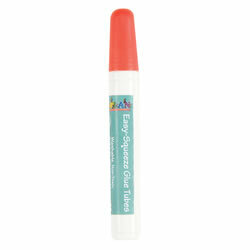 Pack includes 30 glue sticks at .28 ounces each, great for the whole class. Store in a cool, dry place. 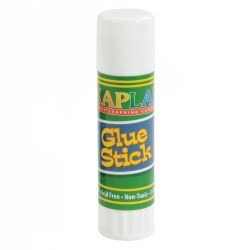 Handy and convenient .34 ounces of white glue in a squeezable tube. Tube size and design help smaller hands increase control and reduce mess. 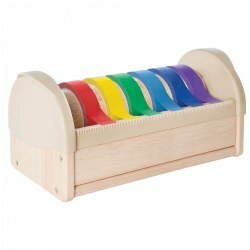 Great for arts and crafts time for the classroom or at home. 4 boxes of 12 tubes. Preserve students' projects or protect shelves and drawers. 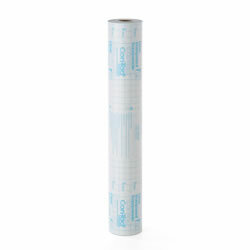 Multi-use 18" x 60' roll of clear adhesive. 4" dual temperature glue sticks. 20 pieces. Use with dual temperature glue gun (18570). 3 years & up. 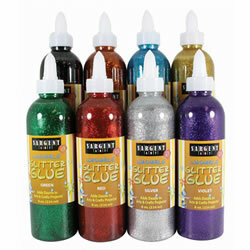 Squeeze bottles allow you to apply just the right amount of non-toxic glitter glue. Eight colors in 8 oz. bottles. Available seaprately or in a set of 8. Glue Sticks go on blue and dry clear. A wide base keeps the stick sturdy for standing. Set of 12, .88 oz. each. Perfect for slime-making, invisible ceramic fixes, and so much more! 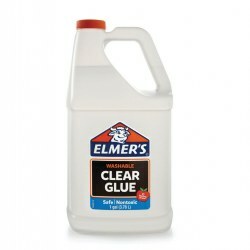 This non-flammable, clear glue bonds quickly and washes off easily. Clear color allows for adjustability before setting or customizability with different color dyes. Included: 1 Gallon of premium, clear washable glue. Colors/dyes shown are not included. 4 years & up. 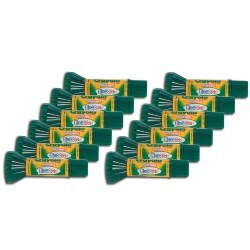 Great for spreading paste, glue and paint. Each spreader is 4 7/8" long. 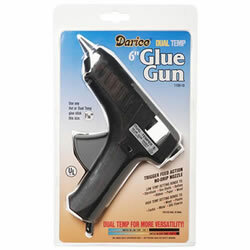 Dual temperature glue gun. Use with 4" dual temperature glue sticks (18571). 3 years & up. The adhesive on this roll of tape is repositionable. Easier for younger children when doing arts and crafts, and great for little hands to work with. 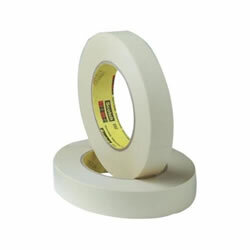 White Kraft Tape roll is 1" wide x 60 yards with 3" core. 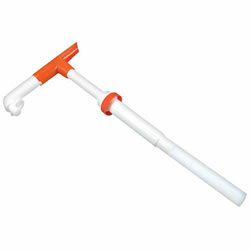 A necessary tool for filling up replacement bottles of glue with virtually no mess and less waste. 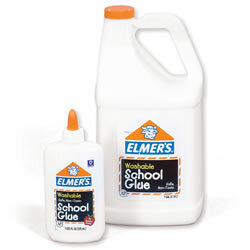 Cleans easily with water and fits Elmer's gallon washable school glue, sold separately. 3 years & up. The adhesive on this roll of tape is repositionable. Easier for younger children when doing arts and crafts, and great for little hands to work with. 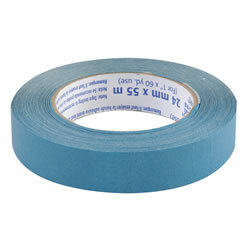 Blue Kraft Tape roll is 1" wide x 60 yards with 3" core. 3 years & up. 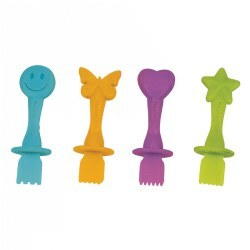 Spread glue or make special effects in paint and clay with the decorative end. 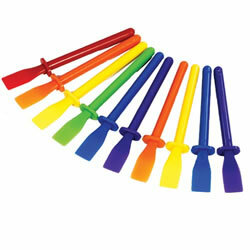 Includes 20 goo spreaders (3 1/2" long). 3 years & up. The adhesive on this roll of tape is repositionable. Easier for younger children when doing arts and crafts, and great for little hands to work with. 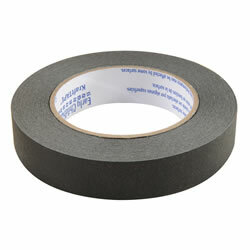 Black Kraft Tape roll is 1" wide x 60 yards with 3" core. Non-toxic glue washes off most clothing and surfaces with soap and water. Easy flow reusable cap fits 8 oz. bottles. For white glue only. Made in the USA.